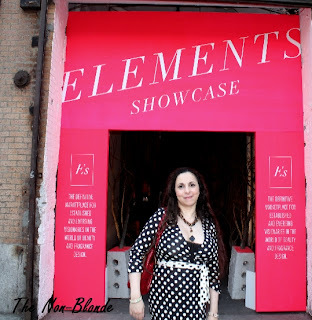 The Blond and I spent a joyful afternoon and evening at the Elements Showcase sticking our noses into just about everything we could. Elements is a curated fragrance and cosmetics show that comes to NYC twice a year (in January and in August) and offers buyers and media a chance to see, smell and experience the most exciting stuff from emerging brands as well as to catch up with established ones. It's always exciting to make new discoveries and reconnect with old friends. Speaking of old friends, it's interesting to note that some veteran and classic brands are making a strong comeback. 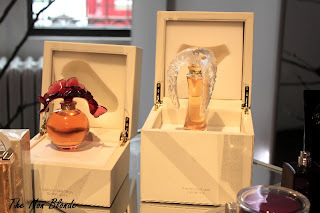 The house of Houbigant had a booth tonight, as did Lalique with their gorgeous limited edition bottles (above. The 2011 edition on the left and the 2012 one that will be available this holiday season is on the right). But the interesting and exciting news come from Jacomo and Jean Patou(!!!). As a big fan of the 1978 Jacomo Silences I was happy to see a new version (Silences Eau de Parfum Sublime) that a) smells good, and b) shows a significant effort to remain respectful to the original. It's a reformulation, of course, and some of the edge has been lost to (insert swear word) IFRA, but if the new Silences will seduce more people to join the green side I will not complain. Jacomo also (re)launched their masculine Jacomo de Jacomo, a hairy chested 1980s classic. But here's the biggest news belong to Jean Patou. Since I reported last summer that the forces of darkness at P&G sold the house, I've been waiting to see where the new owners, Design Parfums, will take it. Apparently, they put their in-house perfumer, Thomas Fontaine in charge of the daunting task of reworking the Patou catalog and fixing the damage. The result, the reintroduction of Joy, 1000 and Sublime will hit the shelves this holiday season. There's also some talk about limited editions from the Ma Collection (nothing definite at this point, mostly good intentions and careful baby steps), and a relaunch of (are you sitting?) Patou Pour Homme. I'll believe it when I smell it (and hold and kiss the bottle), but I'm giddy with excitement at the idea. The main event at the show today was a panel discussing the topic Art & Commerce: Can They Live Together? The participants (above, from left) were Carlos Huber from Arquiste, Mandy Aftel of Aftelier, Christopher Brosius of CB I Hate Perfume (wearing a black kilt and accessorized to the nines), and Jessica Richards from Shen Beauty (a Brooklyn-based cosmetics and apothecary store). Moderated by Virginia Bonofiglio from FIT, the panel discussed some of the business and creative aspects of perfumery in the age of Internet media. Both Brosius and Aftel agreed that having full control and responsibility of pricing and inventory does not clash with their artistic work. On the contrary: they're free of pressures and demands of a marketing department and the their pricing is determined by the actual cost of the raw materials they use. They're artists who own their business and would not have it any other way. "Respect for perfumers: A perfumer is an artist who is at his or her best when creating fragrances for himself or herself, without instructions or marketing constraints. Would we ask a painter to alter his painting to make it fit in with our living room? Let's value the "perfumers' proofs"; those unaltered perfumes. 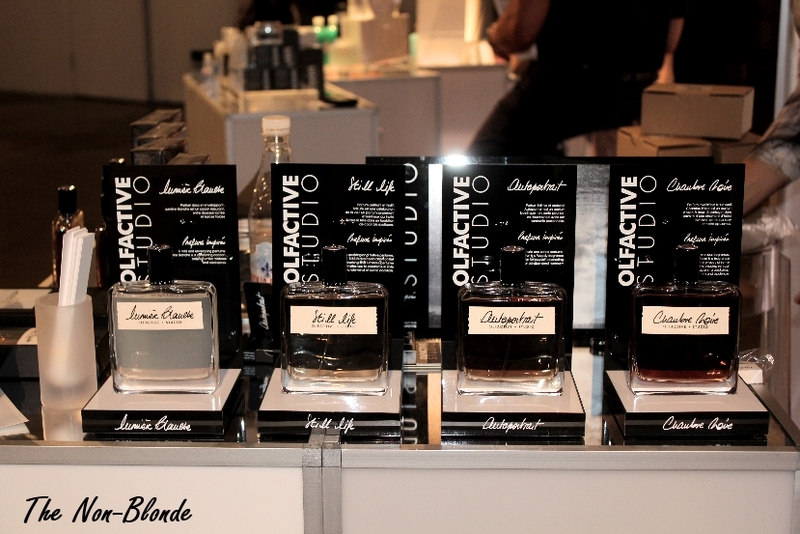 "An authentic olfactory concept: original, never-smelled-before olfactive creations, with strong personalities, made with beautiful raw materials (natural raw materials are given preference), and, without price constraints! We prefer to invest in the quality of raw materials rather than in advertising." There were also several cosmetics and skin care makers, old and new. As you'd expect, there's a lot of emphasis on eco-friendly natural and sustainable ingredients. It will take me some time to go through the skin care samples and make heads from tales, but you can expect to read some more. 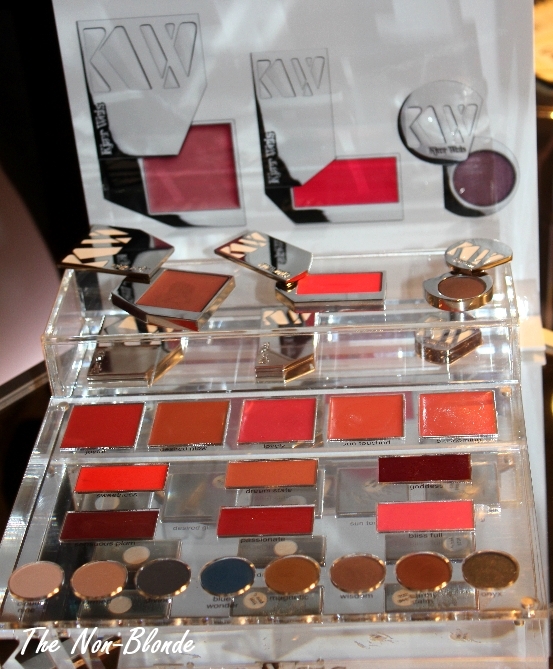 As for makeup, I was delighted to meet Kristen Kjaer Weis, the founder of Kjaer Weis. 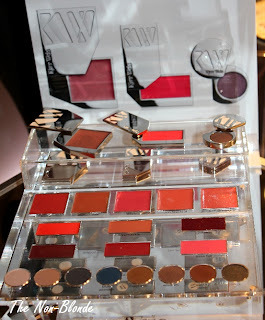 She showed me the three new colors coming out for fall (one in each product category: an eye shadow, a lip color and a cream blush. 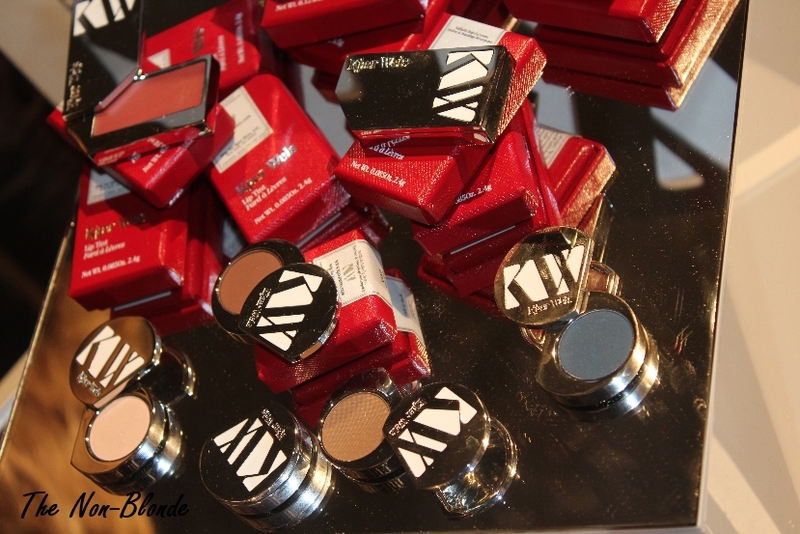 See below) and also told me that Kjaer Weis will soon launch a mascara and a range of six foundations. I'm thrilled. There's a lot to re-smell, read and process. 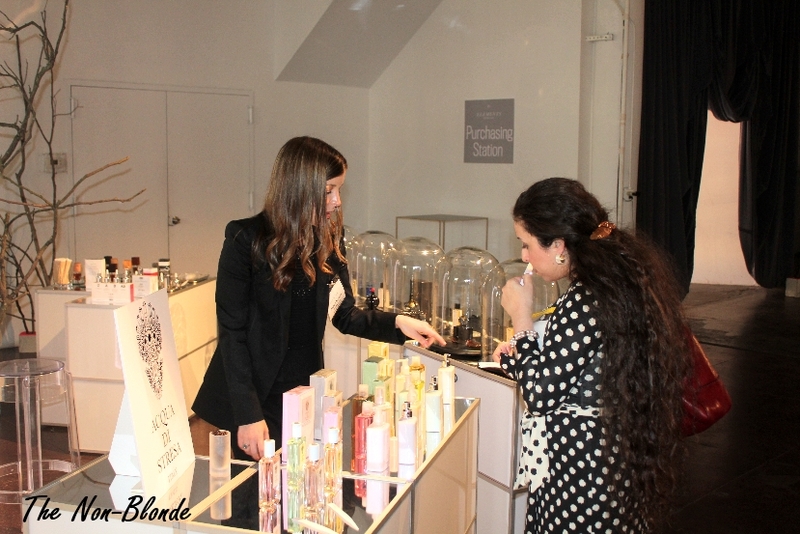 You'll hear about many of the new fragrances and products in the coming weeks. I'll leave you with one last photo of an exhausted, perfumed and overstimulated Non-Blonde leaving the show. Two second before the husband took the picture I managed to tear a strap in my sandal, so I was a) unable to walk, and b) not amused. But all's well that smells well, right? 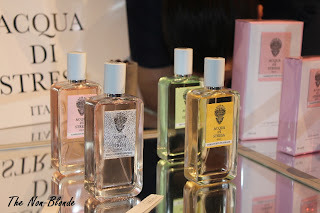 Great report Gaia, I'm so very excited about the news regarding Patou, especially Sublime... Do you think there's any chance Eau de Patou might be returning? Very cute dress by the way. Doesn't Designer Perfumes also own Scherrer now? I have a new and old version of the EDP and the new is quite close. If so, they deserve an award just for saving Scherrer, speaking of green. I enjoyed your report, Gaia, especially since I couldn't go this time. I'm seconding Elizabeth on the dress and Jillie on your hair. The polka dot paired with the reverse pattern looks so chic! And your hair is just gorgeous. It was really fantastic to get the chance to talk with you Gaia, I enjoyed it so much and could hardly tear myself away! 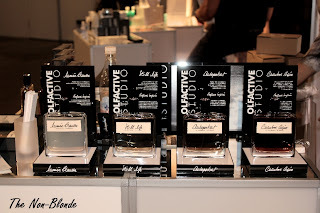 And thank you for this terrific post about the Fragrance Foundation panel – it was exciting to find out I had so much in common with Christopher Brosius! Wow your hair is the stuff dreams are made of!Absolutely glorious! You look great - and what beautiful hair! Gaia: May I please have some of your hair? I used to have long, thick hair so I remember what a trial caring for it can be. I would give anything to have it back! Curious? Any natural perfumers? I have allergies now that keep me from my old favorites and have been turning toward the naturals like Aftelier. I am now in search of the new perfumers that really keep it pure.